Jon Kabat-Zinn (born June 5, 1944) is Professor of Medicine Emeritus and founding director of the Stress Reduction Clinic and the Center for Mindfulness in Medicine, Health Care, and Society at the University of Massachusetts Medical School. He teaches mindfulness meditation as a technique to help people cope with stress, anxiety, pain and illness. His life work has been largely dedicated to bringing mindfulness into the mainstream of medicine and society. Kabat-Zinn is the author or co-author of scientific papers on mindfulness and its clinical applications. He has written two bestselling books: Full Catastrophe Living: Using the Wisdom of Your Body and Mind to Face Stress, Pain and Illness (Delta, 1991), and Wherever You Go, There You Are: Mindfulness Meditation in Everyday Life (Hyperion, 1994). He co-authored with Myla Kabat-Zinn Everyday Blessings: The Inner Work of Mindful Parenting, (Hyperion, 1997). Other books include Coming to Our Senses (Hyperion, 2005) and his most recent book The Mindful Way Through Depression: Freeing Yourself from Chronic Unhappiness, co-authored with J. Mark G. Williams, John D. Teasdale and Zindel V. Segal (Guilford, 2007). Kabat-Zinn is the founder and former Executive Director of the Center for Mindfulness in Medicine, Health Care, and Society at the University of Massachusetts Medical School. He is also the founder (1979) and former director of its renowned Stress Reduction Clinic and Professor of Medicine emeritus at the University of Massachusetts Medical School. Kabat-Zinn received his Ph.D. in molecular biology in 1971 from MIT where he studied under Salvador Luria, Nobel Laureate in Medicine. Kabat-Zinn has made significant contributions to modern health care with his research which focused on mind/body interactions for healing, and on various clinical applications of mindfulness meditation training for people with chronic pain and/or stress-related disorders. 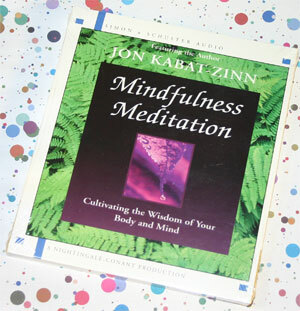 Kabat-Zinn began teaching the Mindfulness-Based Stress Reduction (MBSR) at the Stress Reduction Clinic in 1979. MBSR is an eight week course which combines meditation and Hatha yoga to help patients cope with stress, pain, and illness by using moment-to-moment awareness. Such mindfulness helps participants use their inner resources to achieve good health and well being. Kabat-Zinn and colleagues have studied the effects of practicing moment-to-moment awareness on the brain, and how it processes emotions, particularly under stress, and on the immune system. In 1993, Jon Kabat-Zinn’s work in the Stress Reduction Clinic was featured in Bill Moyers' PBS Special, Healing and the Mind and in the book by Moyers of the same title. Kabat-Zinn and his colleagues published a research paper demonstrating in a small clinical trial, a four-fold effect of the mind on the rate of skin clearing in patients with psoriasis undergoing ultraviolet light therapy: [Kabat-Zinn et al, Psychosomatic Medicine 60:625-623 (1998)]. A more recent paper [Davidson, Kabat-Zinn, et al. Psychosomatic Medicine 65: 564-570 (2003)] shows positive changes in brain activity, emotional processing under stress, and immune function in people taking an MBSR course in a corporate work setting in a randomized clinical trial. He conducts annual mindfulness retreats for business leaders and innovators, and with his colleagues at the Center For Mindfulness, conducts training retreats for health professionals in MBSR. Over 200 medical centers and clinics nationwide and abroad now use the MBSR model.